SHARMINI PERIES, EXEC. PRODUCER, TRNN: Welcome to the Leo Panitch report on the Real News Network. In the UK the newly elected Labour Party leader Jeremy Corbyn has received much acclaim, as we reported yesterday. But also under a great deal of criticism from the media, the political left, and the right. Some of the criticism launched at him is coming from his own party members, from the Blairites for dividing the party, and for questioning him on whether he can keep the party together. This is in spite of the fact that former party leader Ed Milliband has endorsed his victory and is urging the party to unite. And from the right, even the British Prime Minister David Cameron took to Twitter saying that the Labour Party is now a threat to our national security, economic security, and our families’ security. Now joining me to discuss all of this is Leo Panitch. He’s the Canada Research Chair in comparative political economy, and a distinguished research professor of political science at York University in Toronto. He’s the author of many books, among them The End of Parliamentary Socialism: From New Left to New Labour, and Renewing Socialism: Transforming Democracy, Strategy, and Imagination. Leo, good to have you back on the Real News Network. PERIES: So Leo, let me just start with why the British Prime Minister David Cameron is behaving in this way. UK is a parliamentary democracy after all, and Labour does have 232 seats in parliament. 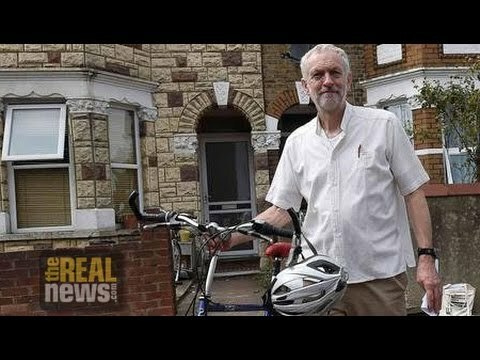 Is Corbyn a real threat to the Conservatives? PANITCH: Well, I don’t know if he’s a threat to the Conservatives. We’ll have to see. A lot of people feel that, and Tories say so, that they’ve been guaranteed victory in the next election. But using that kind of language is absolutely astonishing, and imagine what the response of the British media would be if Chavez had said, or Putin had said, that the opposition leader was a threat to national security. You can actually be sure that Jeremy Corbyn has a file on him by the security service, the MI5. He has been a very, very principled opponent of American imperialism and the British involvement in American empire. He was a key campaigner against nuclear weapons, and he was chair of the Stop the War coalition, the coalition remarkably popular and broad in Britain against the war in Iraq. So that’s what is meant when he’s a threat to national security. And what he’s challenging is the continuation of this cold war mentality. I heard that one not very left-wing Labour member of parliament, when asked what he thought of Jeremy Corbyn’s views on not renewing the Trident, the nuclear submarine, she said, well, isn’t it a good thing to want to get rid of weapons of mass destruction? In that sense you can see that some, even some Labour MPs may feel liberated by there finally being a leading politician who is willing to say, look, there’s a bogeyman here. And we need to be thinking in the 21st century in a way that takes us out of the old imperial machinations that the Labour Party got so enveloped in so long ago. I might remind your listeners that the first Labour government ever elected, it was a minority government, in 1924 was brought down by a forged letter published in the British media which allegedly came from a leading Communist in the Soviet Union. The Zinoviev letter, it was called. And it was a forged letter, presumably directed to the Labour leader Ramsay McDonald. So these guys play hardball. And you can be damn sure they’re going to be playing hardball against Corbyn for voicing entirely sensible views which should have been part of mainstream discussion a long time ago. PERIES: Now, the British media is of course calling him a radical, trying to marginalize him as much as possible. But his politics are radical, when it comes to his position on NATO, and what has happened in terms of Israel and Palestine. Can you elaborate on that, and are these radical positions? PANITCH: Radical positions in the context of mainstream politics. He gave a speech today to the Trade Union Congress, and it was a very well received speech. And it’s notable that he didn’t say anything there about NATO, nor did he say anything about leaving the European Union, which I don’t think he’s in favor of, actually. I think what he wants is a realignment inside the European Union of the left European parties, and it’s to be hoped that he’ll be in discussion not only with the social democratic parties in Europe who are very neoliberal and very centralist in terms of increasing the powers in Brussels, and that he links up with the left European parties, [Die Linke] and Syriza in Greece, and so on, Podemos in Spain, in order to–and this I think would go over well in Britain, in order to have a more decentralized European Union, one which would leave more room for maneuver to register the balance of forces to shift to the left in European countries. So he’s radical, there’s no doubt about it. The question, the challenge for British democracy, and indeed for any Western capitalist democracy, is can it live up to its democratic pretensions? Can it actually provide room for genuine, radical politicians and movements to find their way in the system? It allows them demonstrations, but does it allow them the room to actually challenge, to enter the state? Already Ed Milliband, who was by no means as radical as Corbyn, was traduced for not toeing the line on some things, including on Israel where he called for a bi-national state, two separate states, rather, one in Israel one in the Palestinian lands. So Corbyn has gone much further than that. But this kind of space is not clear. One of the things we need to be aware of is that in terms of limiting democracy, what is taking place today in Britain, and was the central subject of Corbyn’s speech to the Trade Union Congress, is an attack on fundamental trade union rights. The first major piece of legislation the new Conservative government introduced, the Trade Union bill, makes it much, much more difficult, especially in the public sector right across Britain for trade unions to exercise the right to strike. PERIES: Leo, Corbyn came to power boosted by support from many of Labour’s 15 affiliated unions, including the country’s two largest unions, I understand, Unite and Unison. Now, there is a bill that you’re referring to here that might be, and I’m speculating here, why Cameron has gone so on the attack. This bill is rather important. Can you give us some frame on what it’s about, and how Corbyn might fight back in favor of the unions? PANITCH: [Percent] of union members voting in any strike vote. And in the case of a public sector strike, particularly aimed at teachers, et cetera, requires 40 percent of all eligible voters to vote. On that basis British governments who haven’t gotten 40 percent of the vote wouldn’t have gotten elected. It’s a draconian attempt to restrict union power, union influence, at a time when strikes are in any case extremely low in Britain. And Corbyn even raised the question of whether it was not in violation of the European human rights codes. So this is very significant. PERIES: From what I understand even some of the Conservative members of parliament are opposing it, particularly in reference to picketers being asked to give their names up to police and so on. PANITCH: Exactly. There’s a whole series of elements in it that are very anti-democratic. PERIES: And also, I would like to get a little bit into the critique of Corbyn from the left and from his party members. I know there’s historical debate on whether the party is socialist, and of course the Blairites and the more recent leadership has of course pulled it in the other direction. Now, is there the potential for this party to revive socialism as one of the missions of the party? PANITCH: Well, you know, the Labour Party was always very tepidly socialist. As one of of its leaders once said, the Labour Party was always more Methodist than Marxist. And it was never admitted into the Second International of social democratic parties back in the beginning of the 20th century because it didn’t accept the idea of class struggle. The leadership, at least, always promoted the idea of class harmony. That said, it had been committed from 1918 on to the public ownership of the means of production. And it certainly has had a great many socialists in it, and it has introduced some of the great reforms of the 20th century, above all the National Health Service. The leadership of the party, the parliamentary leadership of the party made up of career politicians, turned their backs on any notion of a transition to socialism at the middle of the 20th century very clearly, and committed themselves to a mixed economy. Now, insofar as capitalism seemed to be able to service both the welfare state and rising wages, and increase the power and influence of capitalists, above all in the British case bankers, since the city of London is one of the financial capitals of the world, integrated with Wall Street. When those two things looked like they might be compatible in the 1950s, they perhaps could get away with it. But really from the 1960s on with the crisis of the Keynesian welfare state, the fiscal crisis that emerged by the end of the 1970s and so on, the Labour Party has constantly been riven by conflicts over whether it should not, in fact, try to go beyond the welfare state to actually build on those reforms to move towards a post-capitalist society, a democratic socialist society. And the right in the party, the center-right in the party, and even when there was a real conflict over this the center-left and the union leadership, would back away from this. Certainly would not try to mobilize their membership in favor of it even though many of the rank and file members of the party remain committed to this. And you know, the–what Corbyn represents is a tiny minority of parliamentarians. A much larger portion of party members who are oriented to trying to put on the agenda once again the possibility within a democratic society of electing a government which would try to move us away from a market-driven capitalism to democratic economic planning. That’s impressive. It’s remarkable that 40, 50 years after this was first attempted in the Labour Party in the post-war era that they’ve elected a leader who has consistently stuck to this. And what’s even more remarkable and very important is that this is the first Labour leader in how long who doesn’t run away from, is not embarrassed by strikes, by protests, by things like Occupy. Labour leaders to preserve their respectability have always distanced themselves from this. Corbyn immediately after he was elected going to a rally for refugees indicated where he stands on this. It’s a matter of tone, and the crucial question will be whether he’s going to be able to turn those 250,000 people who voted for him, including almost 100,000 trade unionists, into active campaigners in their unions and in their communities for these kinds of ideas. The Labour Party at the branch level doesn’t have that capacity. And if it continues to mainly be a site where a resolution for the next party congress is debated by 10 or 15 desultory party stalwarts, Corbyn will fail. The crucial thing is to transform the party at the base, and to draw those active trade union leaders at the base in, and to link up with the activists that Corbyn has always been identified with and part of. This will be very hard, and it will drive the careerist MPs, the vast majority of members of parliament, absolutely bonkers. Especially since the press will call this bonkers. They don’t consider this democracy. What they consider democracy are the ins and outs of two almost interchangeable types of politicians every four or five years. PERIES: Leo Panitch, we’re going to be following this with much interest, and hope you join us again very soon. PANITCH: Be happy to watch it with you, Sharmini. It’s going to be interesting, and in some senses ugly, as we began this conversation noting. PERIES: That’s right. Thank you so much for joining us today. And thank you for joining us on the Real News Network.